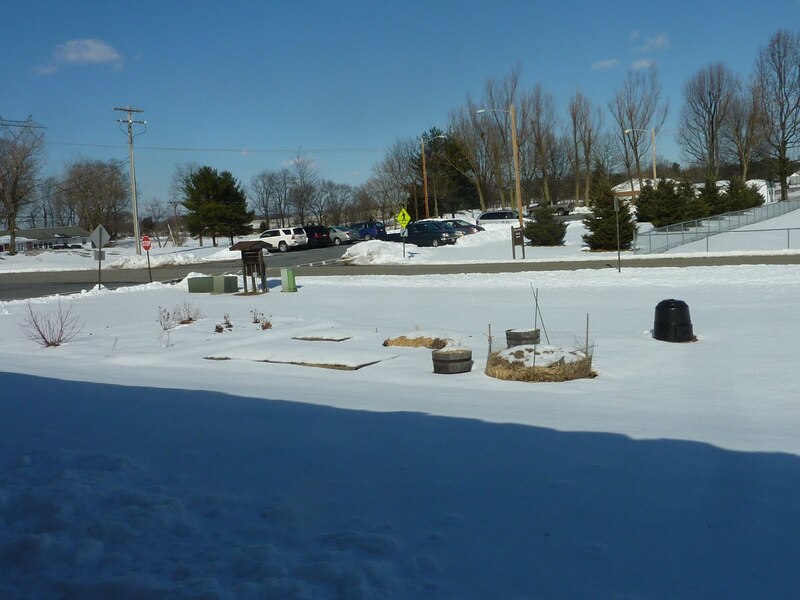 It’s finally not like this outside anymore, so yesterday we had our first workday at the Demo Garden at the Sharpsburg Extension Office. The Washington County Master Gardeners started it two years ago, and this year I’m the self-appointed documentarian. Over the course of this growing season I’ll be pointing out things of interest that happen there, as well as in my own garden. Just to bring you up to speed, in February 2009 we put in two 4×4 square foot beds, a 4×12 lasagna (sheet composting) bed, two barrels, and a compost bin. In March 2010 we put in a rain garden with native plants (which from our veggie garden’s perspective is a great way to attract pollinators), and at some point a plastic composter was added. Today we installed an Earthbox, a birdhouse, and a bench. We weeded, moved strawberries from barrel to berm, edged, put up a birdhouse, turned the compost pile, emptied the plastic composter and laid compost on the beds, set up pipe trellises and used twine to mark square foot spaces in the two 4×4 beds, planted peas in a barrel and covered them with straw, planted a traditional square foot garden (SFG) in one of the 4×4 beds, planted Brussels sprouts in an Earthbox, planted alyssum, kale, parsnips, and dill in the lasagna bed, and rebuilt the compost pile with browns and greens we brought in. Left over from last year are the garlic we planted on the fall in the second 4×4 bed, and some parsley in the second barrel. What I learned today is that I’d like to hire this crew to work in my home garden (in which I’ve not had time to plant yet), and that time flies when you’re working with others. We had everything done (see photos) in less than 2 hours. ← How Large a Rake Do You Need?